Since I’ll be discussing External Knowledge Management: Using Internet Resources to Your Advantage at LegalTech next week (see my post about it), I thought I’d share a new Google tool that can help. Google Reader is not new, but Google just announced a new feature that allows you to follow changes to any website — even those that do not offer RSS feeds. Obviously, this is a great tool for keeping up with clients’ websites that don’t offer RSS feeds. But even if a website has RSS feeds, you may want to set up the Google Reader tracker for parts of websites that the RSS feeds do not cover. For example, if a company has a web page listing employees, it might not publish changes to that page with an RSS feed. You can keep tabs on who joins or leaves the company by using this new Google Reader feature. Facebook, LinkedIn, Gmail (multiple accounts), iGoogle, Google Docs, Google Calendar, Google Maps, Google Reader, Upcoming.org, Meetup.com, WordPress, Digg, Delicious, Twitter, Netvibes, Picasa, Mac Web Galleries. In the Google applications alone, I have a lot of pretty important information. My Gmail contact information is more up-to-date than my Outlook contacts at work. In some ways — on a smaller scale, of course — I have the same problems as a large enterprise: there’s a lot of information and no easy way to find it. 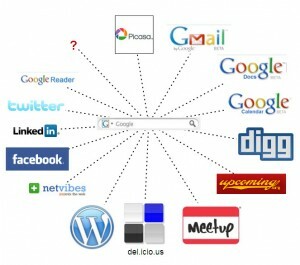 If I am looking for contacts, for example, I can go to Gmail, LinkedIn, or Facebook. But, I have to go to each and search them individually. And with new web applications popping up all the time, it’s only going to get worse. I need a search engine for the enterprise called “me.” One search box that will tap into all of my online silos. Clearly, Google should be the one to offer such a solution. Google already has Google Custom Search, which allows you to build a search box that searches specific sites to the exclusion of others. Several KM folks have written about Custom Search. See here, here and here [Doug, I think there’s a KM blog missing from your KM Sites Search list 😉 ]. So, Google, let’s take Custom Search one step further: maybe call it “Personalized Custom Search” or “iCustom Search” or “Self Search.” Give me the ability to search all of my web apps in a secure, password-protected way. One search that hits all of my web apps. So, when I do a search for my business contact, “Jim Smith,” the results include emails to and from Jim, pictures of Jim that I tagged in Picasa (and in Facebook), a Google Map that shows me where Jim’s office is (based on the information in my Gmail contacts), Jim’s LinkedIn and Facebook profiles, the activities that Jim will be attending from Upcoming.org and Meetup.com (because he is tagged as a friend), his Twitter posts and Delicious tags, etc., etc. While you’re at it, please make an advanced search page that allows me to select or un-select certain web apps. Now, is that too much to ask? By the way, I created the image with Gliffy. Check it out.